Rosemary’s Baby is quite an important book. Although it wasn’t published until 1967, it quickly became the most successful horror novel of the 1960s and caused a renewed interest in the horror genre that was built upon a few years later when William Peter Blatty published his novel The Exorcist. The only person who tries to talk them out of the move is Rosemary’s friend Hutch, who informs them that the building had a rather unpleasant reputation in the early 1900s. When Hutch sees that the Woodhouses are unaware of this he tells them that the Bamford’s former tenants included cannibals and Satanists. In the 1920s it was known as The Black Bramford and it was only the housing shortages after the Second World War that saw the building tenanted again. When Hutch goes on to mention how many suicides there have been in the building, along with a dead baby found in the basement, Guy thinks that he is exaggerating. “Have there been any other ‘unpleasant happenings’ in the past few years?” he asks and Hutch tells him about an elevator man that was killed the previous winter. Despite Hutch’s misgivings Rosemary and Guy settle into the Bramford and make themselves at home. Rosemary even makes a new friend. Her name is Terry and she’s staying with the old couple that lives across the hall from the Woodhouses. Terry is quick to extol the virtues of the Castevets, saying they brought her in off the street, gave her a home, and weaned her off heroin. She also shows Rosemary a charm that the couple have given her to wear. It is a silver filigree ball containing a herb called tannis root. The Castevets grow the herb in their apartment and it is supposed to bring good luck. When Rosemary first meets Terry it’s Wednesday and the girl doesn’t seem to have a care in the world. Two days later she throws herself from the Castevets window and falls to her death. Soon after this the Woodhouses become friendly with the Castevets. Guy is especially taken with the old couple and visits them often. It’s at about this time that Guy, who is a talented actor, gets the break he has been waiting for when a fellow actor goes blind overnight. Guy is given the unfortunate thespian’s part and is a roaring success. Even the critics love him. Then, out of the blue, Guy suggests that Rosemary has waited long enough for the baby that she has always wanted and agrees to start a family with her. On their special night, however, Mrs Castevets brings them some homemade chocolate mousses. Guy says his tastes fine, but Rosemary’s tastes strange and she doesn’t want to eat it. Guy get quite angry about this, insists that there is nothing wrong with the mousse, and tells her to eat it. Rosemary eats most of the mousse but sneaks some of it into her napkin. Not long after this she starts to feel strange and passes out. When she wakes up the next morning she is naked and covered in scratches. Guy tells her they were caused by his nails and completed his part of the baby-making process while she was asleep (what a lovely guy he is) because he didn’t want her to miss the chance of conceiving. Rosemary remembers nothing about the coupling, but she does remember a strange dream in which she was carried to a ceremony where Mr Castevet was wearing a black silk robe and drew strange symbols on her stomach using a wand which he kept dipping into red liquid. While he was doing this, several naked people stood watching and chanting along to flute music. Then Rosemary was tied down and Guy made love to her. He felt huge inside her—much bigger than normal—and, as his leathery skin banged against her, she could smell sulphur and tannis. Then when she opened her eyes the eyes staring back at her were yellow. Rosemary’s Baby is not just a story about Satanism and witchcraft; it is also a story of betrayal. Rosemary is betrayed in the worst possible way by the person who should love her the most—her husband. She is also manipulated and kept isolated from her old friends. 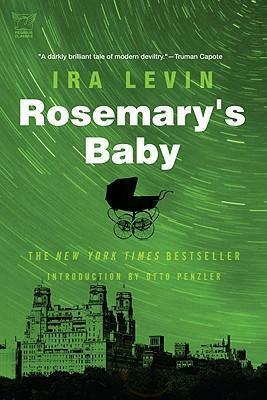 Rosemary’s Baby is a dark story, written well enough to be believable. The tension mounts with the turn of every page and Rosemary’s chances of escape seem to dwindle with each one. It is such a scary story that it would be hard not to love it.